Jacksonville Personal Injury Lawyers: Link & Smith P.C. Thank you for your interest in our Jacksonville, FL law firm. As of 2012, Jacksonville, FL is one of the fastest growing cities in the Southeast. Over 800,000 people now call Jacksonville home. This thriving community is ideal for raising a family in a pristine and quaint city. Jacksonville has all of the perks of both a small town and a big city, including high-quality Jacksonville personal injury lawyers. At Link & Smith P.C., we believe that a beautiful city deserves top-notch lawyers. At Link & Smith P.C., we are dedicated to providing Jacksonville residents with the highest quality legal representation. The citizens of Jacksonville need to be protected from serious personal injuries, and when injured, Jacksonville residents need lawyers with compassion. If you’ve suffered a personal injury, you need the Jacksonville personal injury attorneys at Link & Smith P.C. At Link & Smith P.C., we know the ins-and-outs of the Jacksonville legal processes. There are several unique aspects of the Jacksonville court process, including the fact that serious personal injuries are usually not handled in the Jacksonville Magistrate Court. Most small personal injury claims are filed in the Magistrate Court, but in Jacksonville most serious personal injuries are handled through the State Court system. This is why you need lawyers with the legal knowledge and expertise to handle your claims, regardless of where you live. Our personal injury lawyers in Jacksonville know exactly how the local legal process works, and they will do everything in their power to ensure that you get adequate compensation for your personal injury. If you’re searching for Jacksonville injury lawyers, don’t hesitate to choose our lawyers here at Link & Smith P.C. There are several factors that set our injury firm apart from other practices. At Link & Smith P.C., our lawyers exclusively practice personal injury law. Our attorneys work exclusively on a contingency basis, meaning you never pay any up-front fees. Our attorneys are veteran trial lawyers who have over 40 years of combined experience in the field of personal injury law. Additionally, our attorneys have helped their clients receive comprehensive case results, some worth upwards of $40 million. Our attorneys will provide you with all of the legal benefits, including investigating your case, drafting legal documents, giving you legal advice, and representing your case in court. Our attorneys will not rest until you’ve received the compensation you deserve for your injury. They are always available, and have been dubbed the “accessible lawyers,” because when you call Link & Smith P.C., you will never be speaking with an automated voice machine. 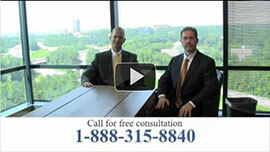 If you would like a complimentary consultation with one of our attorneys about your accident, please contact us today.